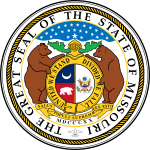 Following is a list of Governors of Missouri since its territory became part of the United States. Missouri was part of the Louisiana Purchase, which the United States purchased from France in 1803. In its first year it was part of Louisiana. In 1804 all of the territory above what is modern-day Louisiana was broken off and administered by a governor based in St. Louis, Missouri until statehood. Prior to the purchase both France and Spain administered the territory in a similar manner. France initially had a commandant in charge of Upper Louisiana. Spain around 1770 began having a lieutenant governor in St. Louis and governor in New Orleans, Louisiana ruling the whole territory. For a list of governors under Spanish and French rule see Louisiana Governor. For a list of lieutenant governors ruling Upper Louisiana under French and Spanish control see List of commandants of the Illinois Country. Since the state capitol moved to Jefferson City in 1826 the governor has lived on the same block in the Missouri Governor's Mansion a block east of the Missouri State Capitol (although the current mansion is the third one). The current governor of Missouri is Republican Eric Greitens. This is a table of congressional, other governorships, and other federal offices held by governors. All representatives and senators mentioned represented Missouri except where noted. * denotes those offices which the governor resigned to take. List of Governors of Missouri Facts for Kids. Kiddle Encyclopedia.